Scanning photos is fraught with hurdles that most of us dont know about. We all assume that to scan a photo you lift the lid on your scanner, insert the photo and press the “scan” button. We just accept the result. With so many scanners on the market and many of them the all in one scanner printer copier type, its difficult to know that the scan you have just made is the best you can get. I’m going to discuss some issues with scanners that Ive come across. You can then look out for these and if possible avoid them when you make a scan. Below you will find visual examples of the problems i see when images are sent to me. You can use these to check your scans to unsure they are suitable for restoration. Any photo restoration is only going to be as good as the digital file that is provided. This is normally a scan of photograph or negative. Scanning prints can result in may problems that a lot of us dont even see. Vertical Tram lines happen when the scanners scanning head or CCD has few dead of malfunctioning cells. This error is then carried all the way down the image but he carriage that carries the scanning head as it sweep across your image. It can also be dust blocking them or on the mirrors within the scanning mechanism. The problem can also be a calibration strip issue. Each scanner has a white strip is uses to calibrate the sensor, if its dirty then the calibration will cause some cells to respond incorrectly and cause the lines down the page. Lastly it could be a defection sensor. Its perfectly possible that the image may have tram lines on it. These are normally caused by the negative processing. 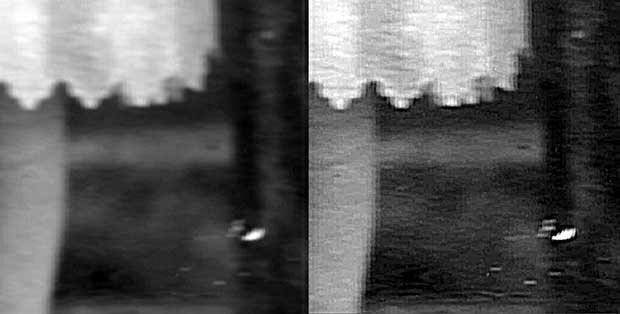 When the negative rolls are cleaned of washing fluid with a squeegee, grit can cause long scratch marks down the full length of the film. Similarly it can happen when washing and cleaning prints. Other instances of tram lines can occur when you scan an image that has been printed on a home printer. The lines are sometimes left by the paper guides in the wet ink as the paper comes out of the printer..
Sending a scan with some tram lines for restoration is no too serious as they can be removed. Severe tram lines is another issue. Obviously a clean image with no tram lines is best. Where there is time taken to remove damage there is a cost, therefore its imperative we get the scan right. Horizontal light banding is caused by the scanning light flickering, due to faulty power delivery, loose scanning carriage or worn cogs on the carriage mechanism. You could try contacting your technical support to see what they suggest for correcting this. It is more than likely it would be cheaper in the long run to buy a new scanner. Particularity if you have many images to scan. Out of focus upper or lower area or patchy focus. In this image the upper half of the photo is out of focus. For comparison the left image is in focus. This is normally caused by the image not being flay on the scanner bed. Ensure your image is flat and not jogged when the scanning is in motion. If needed add a book to weight the lid down to ensure the photo is flat. Similarly its possible that sections of the image appear out of focus due to a bowed or wrinkled image. Adding a book will help here too. When your image is saved after scanning it can sometimes look like this. Details are smeared and blocky. To some that’s normal for their scanner and they cannot see what the problem is. PDF or low compression save options are often the cause. See this post on file compression and saving which should help. Interpolation issues when scanning can present themselves as overly soft jagged and stepped lines. Interpolated images. Those not scanned at the native optical scanning resolutions the scanner has to offer, can end up like the above. Overly wide, stepped edges where the scanner has added data to get a higher resolution scan. That is all it does. It is not more detail at all, just a higher resolution. Better to scan at 600 optical or true resolution than 1200 interpolated. Sparkly edges are caused by over sharpening by cheap all in one printer scanner copiers. This is most likely a combined result of a cheap scanning head and over sharpening of the edges within the image. This is in an effort to compensate for the lack of clarity produced by the scanner. To conclude, there are many but subtle problems you could see on your saved scan result. The above addresses some of the most common. Please check your scans carefully before considering a photo restoration. After all if your scanner had introduced these issues and it make the restoration harder and more expensive, neither of us want that! As always, I’m looking out for you, to help me, get you the best possible result. Scanning photos is fraught with hurdles that most of us dont know about. We all assume that to scan a photo you lift the lid on your scanner, insert the photo and press the "scan" button. We just accept the result. when I have scanned prints made on Ilford fibre base MG, gloss paper but not glazed, the borders often seem blistered, as though the texture of the paper has been exaggerated, mainly in drak areas. Any comment? Could I avoid this by printing the negs onto GLOSS resin-coated, before scanning?